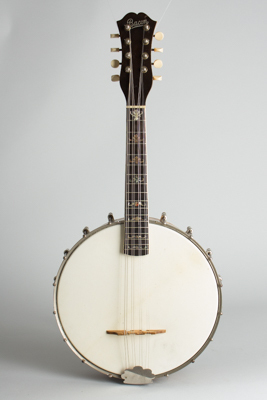 Bacon Orchestra Style B Model Mandolin Banjo, c. 1917, made in New York City, natural varnish finish, laminated maple rim and neck, ebony fingerboard, original black hard shell case. This lovely instrument dates to the era when Fred Bacon subcontracted Rettberg & Lange in New York to build his signature instrument line. Looking quite a bit like banjos from R&L's own Orpheum line, this Bacon Orchestra Model is a fairly fancy and very solidly built mando/banjo with quite a powerful sound. Overall length is 23 5/8 in. (60 cm. ), 10 1/4 in. (26 cm.) diameter head, and 2 7/8 in. (7.3 cm.) in depth, measured at side of rim. Scale length is 14 in. (356 mm.). Width of nut is 1 3/16 in. (30 mm.). This solid little banjo shows some splitting to the ebony cappling on the bottom of ther rim, otherwise it remains very fine overall. All original including bridge and (oft missing!) tailpiece cover, set up with a very good quality skin head. A very fancy and high-quality banjo-mandolin, and boy is it loud! Excellent Condition.